In Quarter 3 2018 the value and number of inward M&A declined, the value of outward M&A increased & the value of domestic M&A saw a notable decline. That being said if you look at the graph for 2018 inbound M&A has remained significantly stronger than for the previous 3 years. The value of inward mergers and acquisitions (M&A) in Quarter 3 (July to Sept) 2018 was £3.5 billion, the lowest value since Quarter 4 (Oct to Dec) 2017; the value of inward disposals also declined reporting a value of £1.8 billion, the lowest since Quarter 4 2017. Outward M&A values were reported at £4.5 billion in Quarter 3 2018, up £2.0 billion on the previous quarter (Apr to June 2018); in comparison, the value of outward disposals (£5.0 billion) was the highest since Quarter 3 2017. 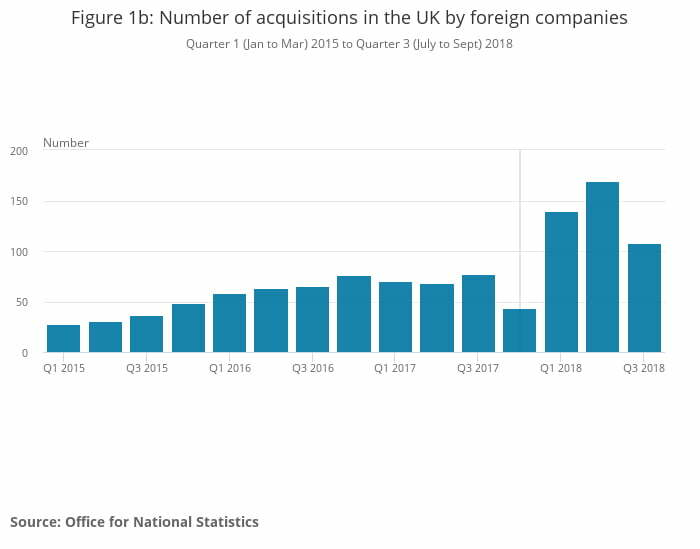 The value of domestic M&A was £3.0 billion in Quarter 3 2018, which was £9.0 billion lower than the previous quarter and the first quarterly decline since Quarter 4 2016. Global mergers, acquisitions and disposals activity can be driven by the availability of credit. Therefore, when credit conditions deteriorate, as happened in the 2008 to 2009 economic downturn, mergers and acquisitions (M&A) activity declines. The process of completing a M&A transaction takes time and sometimes there may be a lag between improving economic conditions and any change in M&A activity.